Fall is a wonderful time of year. Although the glorious summer days are hard to say goodbye to, as the mornings get cooler and frost lingers on the ground, there is the cozy feeling of retreat from heightened activity that comes with the shortening of the days. Thoughts turn to woodpiles, storing and sharing the abundant harvest, and preparing for the long winter months ahead. The fall is a beautiful time in the Cariboo with its brilliant yellow aspens and low-lying shrubs in hues of red and gold. The last of the huckleberries still cling to their branches and bright red high bush cranberries are visible against the dying vegetation. Rosehips are the perfect forager’s treat at this time of year as they soften and sweeten after the frost into delicious bursts of vitamin C. The outer fruit of the rosehips (minus the fuzzy seeds) are delightful when dropped into heated honey and left to settle to the bottom, and then spooned into tea. One of my favourite fall foraging activities is collecting wild mushrooms. On Haida Gwaii, where I spent most of my time wild mushroom gathering, chanterelles are the most commercially desirable species, although there are countless other edible varieties to enjoy. It’s amazing to walk over the same forested ground and witness the proliferation of colourful mushrooms that pop out of every nook and cranny, where only weeks before there were just carpets of green moss. The common names given to mushrooms can be bizarre and you may happen upon the gooey fluorescent yellow of Witches butter, stumble into a cluster of Pyxie cups, or walk into a ring of red and white speckled Fly agaric mushrooms. Some mushrooms can grow as big as dinner plates, such as the edible and prized King Boletus mushroom. From waxy purple to bright pink and lemon yellow, mushrooms come in many colours, shapes and sizes. Mushrooms are interesting in that they are neither animal nor plant (they lack chlorophyll) thus occupying their own Kingdom. Mushrooms are the fruiting body of the larger fungus; most of the fungus is unseen and exists underground as a webbed network in the forest floor called mycelia. The mycelium produces fruiting bodies each year, and these mushrooms contain spores which spread through the air and land in soil with just the right conditions to germinate new mycelia. Different types of fungi play important roles in recycling nutrients by breaking down dead material in the forest or working in symbiotic relationships with the roots of trees to increase the available nutrients to both species. Some mushrooms are parasitic, and attack live trees, causing disease. The thrill of searching for mushrooms in BC has historically been one of the ways people could spend time outdoors, make their own hours, and bring in a bit of extra cash. BC has much to offer the novice mushroom picker, and whether you’re just looking for some Shaggy manes or Hedgehog mushrooms to add to your dinner, or embarking on a serious mushroom picking expedition, there is no shortage of possibilities available. However, mushroom picking is not for the faint of heart, especially if you plan to make a career of it. While the possibility of riches has beckoned many an adventurer, like the gold rush odds, only a few succeed in finding anything substantial. As locals might tell you, back in the heydays of prime mushroom picking areas on Haida Gwaii or in Terrace, each year hordes of people showed up, with a few getting lost in the forest, having close encounters with bears (or hostile mushroom pickers), or deciding they’d had enough of the endless rainy dark days in the forest and jumped back in their vehicles and headed home, many leaving their camps (and garbage) behind. For the seasoned mushroom picker, there is often decades of time and experience spent exploring hidden areas, determining the right time and conditions for harvesting mushrooms at different elevations, and keeping very quiet about ‘glory holes’ when you do discover them. I’ll never forget the thrill of coming over a hill after spending half the day in the woods in the pouring rain with not much luck, and looking out in every direction to see thousands of brilliant orange clusters of chanterelle mushrooms. It definitely gives one a feeling that can only be described as ‘gold fever.’ Although carrying hundreds of pounds of mushrooms out of the bush can be challenging, especially when it involves a river crossing, it always seems worth the effort. Commercial picking is no longer what it used to be in the heydays of the 1990s where prices might hit $50/lb for pine mushrooms or $5/lb for chanterelles and the forest was crawling with people, some even renting helicopters into secret lucrative areas in the Nass region of northwestern BC and coming out with thousands of dollars worth of mushrooms. 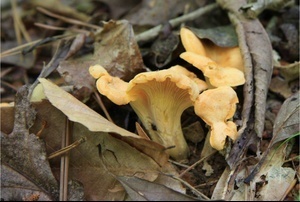 With lower market prices in the past decade for Pine mushrooms (matsutake) shipments to Japan and China and chanterelles to Europe, the picking just isn’t like it used to be. While it’s quite easy to identify edible vs. non edible species of mushrooms once you’ve been shown how or looked at a field guide, if you aren’t sure, you shouldn’t be eating them. There are some look-alikes to common edible mushrooms that are quite poisonous. Otherwise, enjoy the harvest!